The familiar taste of a ripe, sweet Georgia peach is the ultimate flavor of summertime. Nothing beats biting into the fuzzy, soft fruit and hearing the sound of the peel break, while the juices run down your chin. August is National Peach Month and today I’m sharing four new dessert ideas and my tip on the quickest way to peel peaches. I grew up in Middle Georgia, from which according to GeorgiaPeachFestival.com, approximately 83 percent of the state’s peach production comes. We often visit the popular Lane Southern Orchards, a working farm in Fort Valley, Georgia, where on-lookers can watch as peaches are picked fresh and processed on the packing line. My mom and I love going to the Peachtree Café and Bakery there to purchase homemade peach ice cream and fried hand pies. We eat them while sitting in the rocking chairs on the expansive front porch and all is right with the world. This year, thanks to an ideal winter growing season, Georgia growers may be experiencing the Peach State’s biggest crop in more than a decade. Driving down country roads and coming across farm stands with big signs advertising peaches make my heart skip a beat. 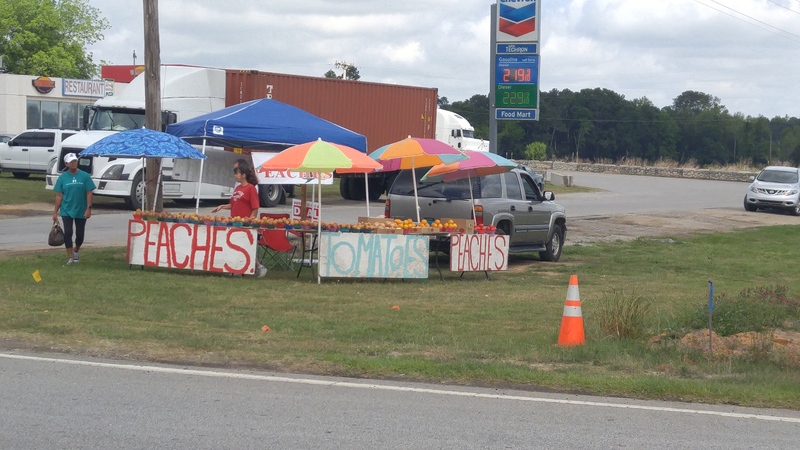 A roadside stand sells fresh summer fruit. The good news is, we don’t have to drive far to reap the benefits of the season’s harvest. I frequent the Statesboro Main Street Farmers Market held each Saturday in the Sea Island Bank parking area in downtown Statesboro, and the peaches are abundant. Something about buying local makes your food taste even better—and there’s no time like the present! Georgia peaches are in season mid-May through August and I’ve been cooking up a storm with them this summer. These desserts are not only Some Kinda Good, but make for a gorgeous presentation. They’re super simple to create and really allow the peaches to shine. Make them as a special treat after a weeknight dinner, or invite a friend over and savor the flavors together. I hope you’ll make these at home and let me know what you think! What are your favorite ways to eat peaches? Share your photos with me on social media using #SomeKindaGood or send me an email at SKGFoodBlog@gmail.com. 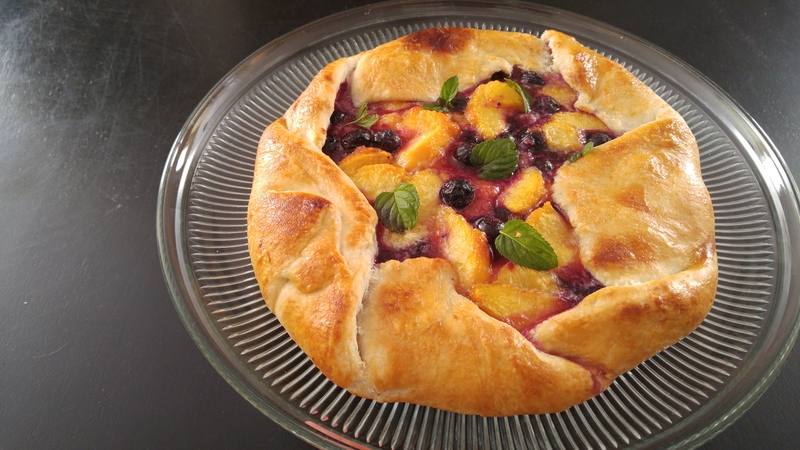 A galette is a French term for a round, rustic, free-form cake. With its flaky, made-from-scratch crust and simple fruit filling, the dessert bakes in just 20 minutes. You’ll love the sweet flavor of the filling bursting with natural juices from the fruit. The orange mint gives the dish a bright pop of green color and a citrusy boost. At first taste of Fried Peach Hand Pies with Bourbon and Cinnamon, you won’t even need to visit the fair when it comes to town. 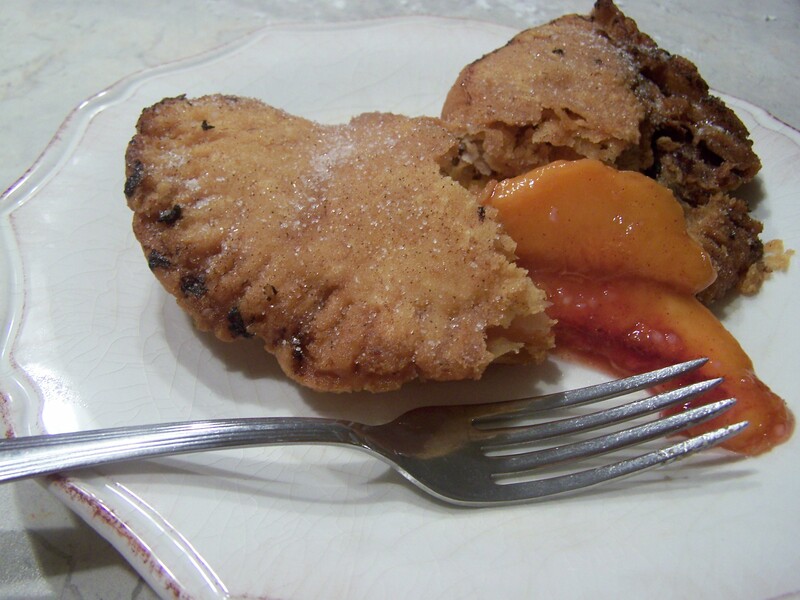 The flaky, crunchy exterior of this turnover with soft, bright red-orange peaches in the center, dusted with cinnamon sugar, is one fine way to celebrate this summer fruit. 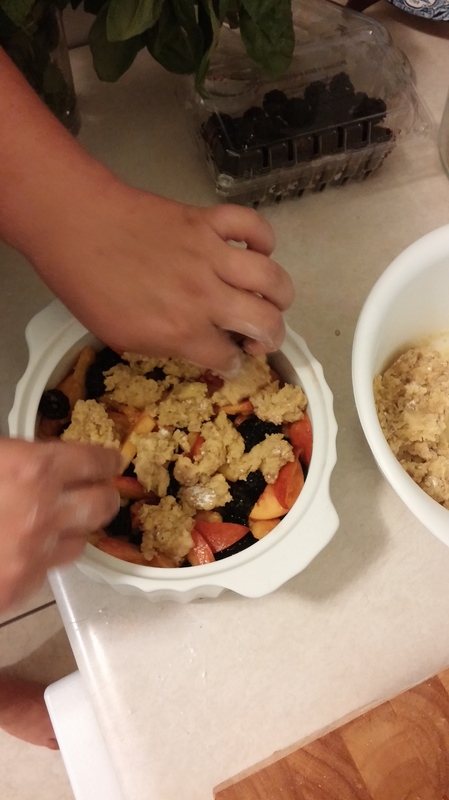 Crumbles make the perfect summer dessert. Simple to throw together, the end result is a crunchy, buttery topping filled with warm, sweet fruit. Serve with cold vanilla ice cream or sweetened whipped cream. No crust required! 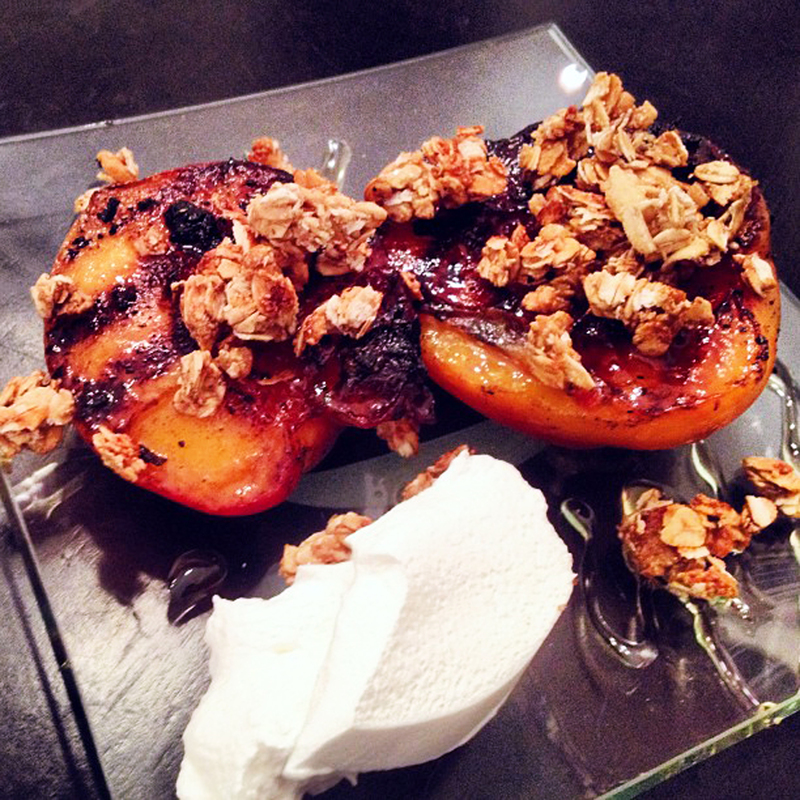 If you’ve never tasted grilled peaches, start living. Grilling fruit intensifies the flavor. This dish satisfies your sweet tooth without packing on the pounds. Remove the peel from peaches in no time with this easy method. Bring a large stockpot of water to a boil. Fill a separate large mixing bowl with ice cubes and water and set aside. Score the bottom of each peach with an X pattern. One at a time, gently add peaches to the boiling water with a slotted spoon. Let them boil for about 20 seconds, ensuring that peaches are fully immersed. Using a spoon, help rotate the peaches as they boil. Remove peaches from boiling water and place them directly into the ice bath for about 20 seconds. Starting from the scored X, peel the skin off the peaches. A version of this article originally appeared in the Statesboro Herald on July 31, 2016. Georgia native Rebekah Faulk Lingenfelser is a freelance writer, entertainer and food enthusiast who writes and speaks about her love of good food and the Coastal South. A Season 2 Contestant on ABC TV’s “The Taste,” she is the Statesboro Herald food columnist and past host of the program “Statesboro Cooks.” Lingenfelser is a student at the award-winning Culinary Institute of Savannah. To learn more, visit RebekahFaulk.wix.com/RebekahFaulk or connect with Rebekah on social media by following Some Kinda Good on Facebook, Twitter and Instagram.